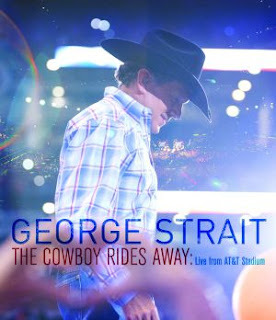 When George Strait announced in late 2012 that he would retire from the road at the culmination of his forthcoming concert tour in 2014, the final gig on the schedule suddenly became a very big deal. How big? Well, the concert (held on June 7, 2014 in Arlington, Texas) ultimately set a new North American indoor-concert attendance record — a distinction held by the Rolling Stones since 1981 — with nearly 105,000 fans packing into AT&T Stadium. Added to that was the gaggle of special guests (including Alan Jackson, Faith Hill, and Kenny Chesney) that showed up to salute and sing with Strait, with each artist helping out on a pair of songs each. Then, of course, there was King George himself, who over the past three and a half decades has garnered more Number One hit singles than any other artist in popular music, period. What could not have been fully anticipated was the sheer emotion of the event, something which the new Eagle Rock DVD/Blu-ray release of The Cowboy Rides Away: Live From AT&T Stadium, so often conveys. Strait is an increasingly rare figure in modern country music, a traditionalist whose appeal and no-frills, “just the songs, thanks” live appearances have endeared him to mainstream audiences of all ages. In watching him perform hit and after hit here — from “Check Yes Or No” to “Amarillo By Morning” to “Unwound” — it’s not difficult to see why, either. For what it’s worth, the performance that garners the biggest ovation from the crowd is not even one of the all-star duets but rather an understated rendition of “The Chair,” which Strait delivers on his own with the elegant command and conviction of a seasoned actor on the stage. 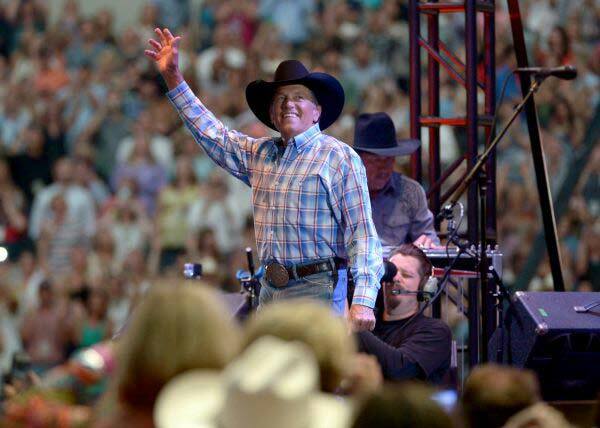 Whether or not the concert captured here proves to be the last of his career, it’s a fitting tribute to the timelessness of George Strait’s singular vintage of country music.